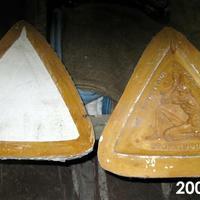 Plaster triangular shaped mold of obverse and plaster mold with plaster core for the reverse of American Institute of Architects Craftmanship Medallion. The yellowish discoloring is from shellac used to seal the plaster. 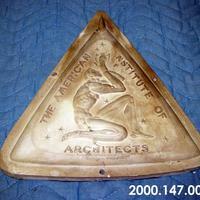 Inscribed on the mold is "American Institute of Architects". Awarded as the AIA Craftmanship Medallion from 1960-1976. 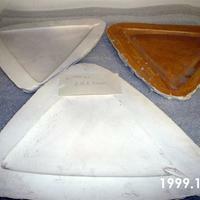 Three plaster blanks triangular in shape. 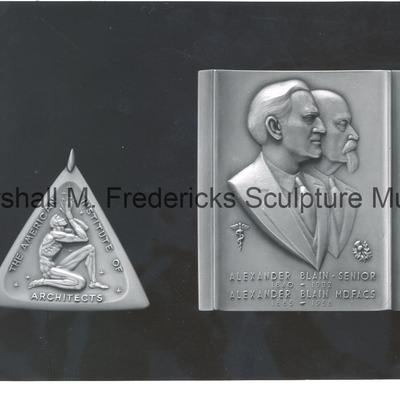 These are for the American Institute of Architects Craftmanship medallion. One has a shellac coating, to seal the plaster, giving it a yellowish color. 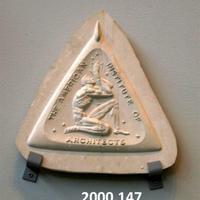 Awarded as the AIA Craftmanship Medallion from 1960-1976.